Celebrating and Commemorating Memorial Day! Please click on the links to the right and explore more about the individual events that were held last year. We are in the planning stages currently and we will have a pretty solid schedule of events to publish here soon. Check back often as we will be continually updating information. Click Events & Exhibits for an overview of all category posts. 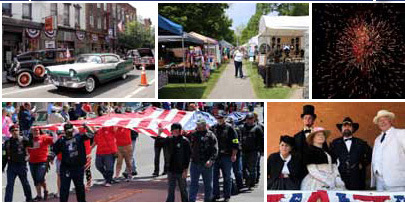 If you ever wondered what goes on in Waterloo, NY during Celebrate Commemorate Memorial Day – look no further! Enjoy these highlights. Featured are: the student creative expressions award assembly, the Henry C. Welles Award Reception, the Celebrate Parade, Arts & Crafts in the Park, the Civil War Encampment and featured impersonators, 5K Race, Wheels on Main Street Car Show, Veterans Bike Rally, and Military Services at the village cemeteries and at the former Main Street School. May 24-27 & 30 in Waterloo, NY. This community event requires many volunteers. If you would like to help out and volunteer some time, please fill out the form below & someone will contact you directly. In the comments area, please indicate the days you are available and your area(s) of interest? Entertainment, History Tours, Concessions, Merchandising, National Memorial Day museum, Car show, Parades, Event set up and teardown. On a spring day in 1865, Waterloo, NY druggist Henry C. Welles watched as a lone widow walked to the cemetery to place flowers on the grave of her deceased Civil War soldier husband. How soon they forget, Welles thought, resolving to do something to make sure that those who gave their lives in defense of their country would not be forgotten. Working with Gen. John B. Murray, Welles planned the first Memorial Day in Waterloo in 1866, and for 150 consecutive years, Waterloo’s citizens have remembered. With parades, prayers and ceremonies. On May 26, 1966, that consistency inspired President Lyndon Johnson to sign a Presidential Proclamation recognizing Waterloo as the official Birthplace of Memorial Day. The goal: To take Waterloo back to the first Memorial Day in 1866 through Living History, while continuing to present the myriad of events that has made Celebrate Commemorate so successful. The 20th annual Celebrate Commemorate observance during the weekend of May 24-27 & 30th, will bring thousands of people “home” to Waterloo to participate events to delight every family member. 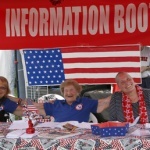 They include musical performances, Art and Craft shows, children’s games, a youth essay contest, and a big parade celebrating our freedom at 11 a.m. Saturday, May 25th. The parade will feature wounded warriors from the VA Hospital in Canandaigua, escorted by scores of Patriot Guard and American Legion motorcycle riders, bands, floats, and military groups including National Guard and active military troops. In Lafayette Park there will be food available. Chicken BBQ’s will be available on Saturday & Sunday as well as an assortment of food booths with a variety of meals and treats for everyone! 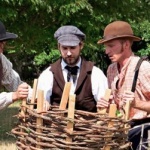 During Celebrate Commemorate weekend, Waterloo will again host Civil War reenactors. Groups will gather from throughout the Eastern United States, including infantry, signal crops, artillery, and fraternal organizations such as the Grand Army of the Republic and it’s Allied Orders; Sons of Union Veterans of the Civil War (SUVCW), Daughters of the Union Veterans of the Civil War 1861-1865 (DUVCW), Auxiliary to the Sons of the Union Veterans of the Civil War (ASUVCW), including two Past Presidents of the DUVCW. The Confederate counterparts have been invited and will share in our commemoration. There will be encampments with reenactors presenting Living Histories of Civil War camp life including many events such as camp cooking, children’s crafts, military training and drills, a Grand Review with President Lincoln, presentations by Civil War surgeons, morticians, sutlers, photographers, artillery with cannon fire, commands by Harriet Tubman and support by the Christian Commission and the Sanitary Commission. Frederick Douglass will share his address as given at Arlington Cemetery on Decoration Day. Special “dignitaries” will include President Lincoln portrayed by Fritz Kline, Harriet Tubman (Carolyn Evans), Frederick Douglass (Michael E. Crutcher Sr.), Dr. Mary Walker and spy Belle Boyd ( Marilyn Dirk), Clara Barton (Eleanor Sterns), Northern sympathizer Elizabeth Van Lew (Nancy Karasinski), mortician (Don Williams), Rev. Scott ( Marty Hillman), Sisterhood of Spies (Karasinski and friends), Mary Gahan of the 148th NYVI ( Caren Cleaveland), Civil War surgeon (Fred Till), Christian Commission by Beth and Jessica Cade, Colonel John B. Murray ( Tim Bills) and President Teddy Roosevelt (Gib Young). During the Civil War, the Village of Waterloo was not only committed to supporting the Union efforts, but also was well positioned in the Underground Railroad with several houses being used as stations for runaway slaves. The village also was the Birthplace of the Women’s Rights movement. The M’Clintock House was the sight of the planning session for the First Women’s Rights Convention kicking off the largest social movement in American history. Elizabeth Cady Stanton and several others drafted a document they called the Declaration of Sentiments, ratified on the second day of the convention, which proclaimed that “all men and women are created equal” and women must have the right to vote. Located at 14 East Williams Street, this National Park Service site will be offering interpretive programs and costumed interpretation throughout the day. 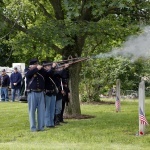 On May 30, which Waterloo always observes as Memorial Day in keeping with Logan’s Orders, children will decorate graves of veterans, there will be prayer services in the village cemeteries, the village’s VFW and American Legion will conduct a military parade at 4 pm. Ceremonies in Lafayette Park will feature government officials and special dignitaries. Those attending the festivities in Lafayette Park are reminded that while everyone is invited…. and the event is alcohol free. The National Park Service at Women’s Rights National Historical Park is pleased to be a sponsor of Waterloo’s Celebrate Commemorate Memorial Day 2018 event building relationships with the communities we serve. We hope to see you at the National Park Service’s Waterloo site, the M’Clintock House, at 14 East Williams Street.